On the heels of the historical world record sale achieved for Three Studies of Lucian Freud at $142,405,000, Christie’s is pleased to offer Francis Bacon’s Three Studies for a Portrait of John Edwards, from 1984, as the highlight of the May 13th evening sale. Celebrating one of the most significant relationships in Francis Bacon’s life, this painting represents John Edwards, a bar manager from the East End of London, who Bacon had met a decade earlier and who went onto to become one of the artist’s inseparable companions, his most trusted confidents, and the rare witness to the artist at work. Three Studies for a Portrait of John Edwards, embodies the sense of calm and confidence that came over Bacon work in the last decade of his life. Estimated in the region of $ 80 million, the triptych will be on view at Christie’s King Street before being at auction in New York on May 13th. “We are honored to announce one of the greatest paintings from Francis Bacon’s acclaimed Late Period. Three Studies for a Portrait of John Edwards, executed in 1984 was the centerpiece of the artist’s retrospective at the London Tate Gallery in 1985-86, and a work that the artist himself ranked amongst his best works. It shows an incredible tenderness and harmony that was prompted by Bacon’s paternal relationship with the sitter, and this period of contentment elicited a confidence of style that has been compared to late Matisse”, said Brett Gorvy, Chairman and International Head of Post-War and Contemporary Art. John Edwards first met Francis Bacon in 1974 and became his companion until the artist’s death in 1992. Edwards was from the East End of London and from the outset his relationship with Bacon differed fundamentally from that earlier relationship with his lover and muse, George Dyer. Edwards, however, was not destined to be swallowed and destroyed by the love of the great artist in the way that both Dyer and Dyer’s predecessor, Peter Lacy had been. Indeed, Edwards is known to have stood up to Bacon and this forthright quality along with his honesty greatly endeared him to the artist. According to longtime friend Ian Board – the owner of the infamous Soho drinking club the Colony Room – Bacon was “riddled with love” for Edwards and became increasingly protective of him as an adoptive son. 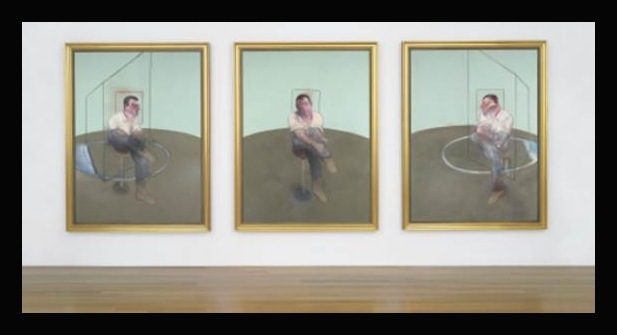 Three Studies for a Portrait of John Edwards is a rare and important triptych from the 1980s that in many ways reflects the different nature of Bacon’s relationship with Edwards. A major work that attempts to capture the essence of the straightforward and forthright character of the artist’s. Young companion, this three-paneled portrait was chosen by Bacon to be the final work of his second retrospective exhibition. Bacon’s first retrospective at the Tate Gallery in 1962 had begun with his first triptych, Three Studies for Figures at the Base of a Crucifixion of 1944 and ended with his great reworking of this painting, the 1962 Crucifixion triptych. The second Tate retrospective paid even more attention to Bacon’s great triptych paintings and beginning with the same 1944 painting, it culminated with the Three Studies for a Portrait of John Edwards which had been painted one year earlier. Across a magnificent triumvirate of monumental canvases Bacon paints near life-size portraits of his companion John Edwards in a relaxed pose. Each painting displays a different aspect of Edwards’ handsome profile, beginning with the right side, before moving onto a full frontal view and ending with a glimpse of the left side of Edwards’ face. In each painting Edwards sits on a tall stool, his right leg pulled tightly upwards over his left knee. His classically sartorial combination is embellished by a brilliant flash of crimson red collar from a garment that Edwards wore underneath his crisp, white shirt. While the subtle nuances of this striking pose are clear to see, it in his depictions of Edwards’ handsome facial features that Bacon really lavishes most attention, and in each of the three panels Bacon assembles a range of delicate and not so delicate painterly layers to build up an incredibly detailed and nuanced rendition of Edwards’ face. His strong jaw line is highlighted by a graceful sweeping arc in the left most canvas, accentuated by delicate chiaroscuro, and almost imperceptible shifts of skin tone are visible ranging from pale white to a more ruddy crimson. In each of these canvases, Bacon incorporates one of his signature techniques by using the cut-off ends of corduroy pants to apply, and then manipulate, the paint across the surface of the work resulting in thin ridges of pigment which give added depth and volume to his subject’s face. Francis Bacon died in April 1992 and in his will he named John Edwards as his sole heir and keeper of his estate. Over the next decade, until his own death in 2003 aged 53, Edwards maintained Bacon’s legacy by overseeing the artist’s archives, including donating the contents of his Reece Mews studio to the Dublin City Gallery The Hugh Lane in 2001. This level of trust that Bacon placed in Edwards was perhaps the ultimate demonstration of the close relationship between the two men. These three canvases are the physical manifestation of that trust, and the permanent legacy of one of the most powerful relationships that Bacon had ever experienced.